The Dunbar real estate market is considered to be one of Vancouver's prime single family residential neighbourhoods. The area offers residents easy access to the downtown central business district, the Vancouver International Airport, and all the conveniences that the city of Vancouver, BC has to offer. In addition to its handy location, the Dunbar district also comes with an abundance of green space and beautiful scenery. 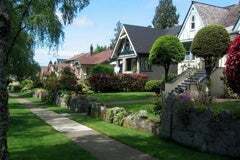 Vancouver's Dunbar neighbourhood is known for its tree-lined streets, excellent schools (including St. George's private boys school), and its parks (most significantly bordering Pacific Spirit Regional Park to the west). Pacific Spirit Park is known for its many kilometers of trails, as well as the Camosun Bog, which is a two thousand year old wetland revered by the Musqueam people. The Dunbar real estate market is perfect for families looking for a beautiful area to call home, in the heart of Vancouver.